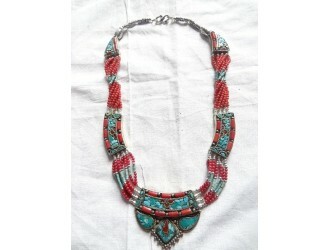 Nickle Free metal, Green turquoise lotus petal with Blue Lapis stripe, handmjade Fashion necklace, 2..
Nickle Free metal with multi-color stones setting fashion bracelets, 6 to 7 inches length..
Nickle Free metal, with coral beads and turquoise setting as design, 22 inches len..
Nickle Free metal made Necklace with Red Coral and Green Turquorise Pattern all over as design.22 in..
Nickle Free metal, Red coral Stripes all round as design , handmade Fashion necklace, 22 inch.. 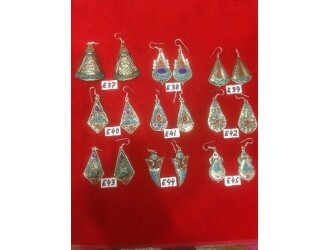 Traditional design dingle earring, made of Nickel free metal with stone setting. 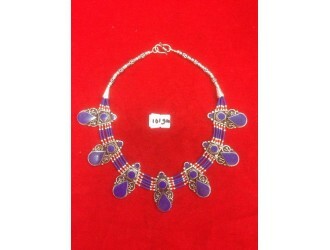 ..
Nickle Free metal, Blue Lapis beads mix as design, 22 inches length, handmade in Nepal.. Fashion Necklaces, beautifully design Green turquorise lotus flower design Necklaces with &nbs..
Nickle Free metal, Red coral lines 2 sides round, and middle turquoise as design , handmade F..